Just in time for Star Trek's 50th anniversary, the original U.S.S. 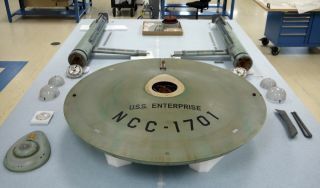 Enterprise model used in The Original Series is undergoing extensive restoration at the National Air and Space Museum. The voyages of "Star Trek's" USS Enterprise now include an extensive restoration at the hands of the Smithsonian's National Air and Space Museum in Washington, D.C.
Work on preserving the 11-foot (3.4 meters) model craft is now underway, in an effort to make the ship resemble how it looked in the episode "The Trouble with Tribbles." That episode was the last known modification to the model during the run of "Star Trek." The model appeared in all 79 episodes of the original "Star Trek" TV series, which ran from 1966 to 1969. Museum officials will paint the Enterprise in April using reference photos from the model's history, partly gathered from Trek fans who took pictures of the ship over the years. The engine casings (nacelles) will house LED lights that will mimic what fans saw on the TV show. "The LED lights can be programmed to match the original VFX [visual effects] footage while eliminating the burnt-out bulbs, extreme heat and motor problems that troubled the original lights," said museum conservator Ariel O'Connor in the same statement. "It is a wonderful solution to re-light the nacelles while ensuring the model's safety and longevity." Meanwhile, the model has been separated into its components for individual study, photographing and X-raying to determine their condition. So far, conservators have found that the secondary hull needs a metal collar to stabilize the structure, which is currently held together by old adhesive and no other support. To advise on the paint job, the museum added two new experts to its advisory committee: Academy Award-winner Bill George from Lucasfilm's Industrial Light & Magic (ILM) and Kim Smith, now with Creature Art & Mechanics Digital and formerly with ILM. These two members, along with current advisor John Goodson of ILM, have combined experience on eight "Star Trek" films and four episodes of "Star Wars." Also, Smith's father — mural artist William A. Smith — advised artist Robert "Bob" McCall as he painted the museum's mural "The Space Mural: A Cosmic View."